I noticed after updating WD to its latest engine, it will lock the User Profile Service durring shutdown and/or logoff. Thus the UPS cant write changes to the registry for the user session. This results is lost and discarded chages made to the registry. In the event viewer it shows an error for USER PROFILE SERVICE could not write/access the registry due to another process that has not released/terminated. Soon as I disabled WD, the error no longer appeared in the event viewer on shutdown/logoff and all registry changes were saved. It has to do with the new kernel protection that was updated in WD. Has anyone else experienced this problem running the latest engine update (aug 2007) under Vista? I get an error message when I start my computer. 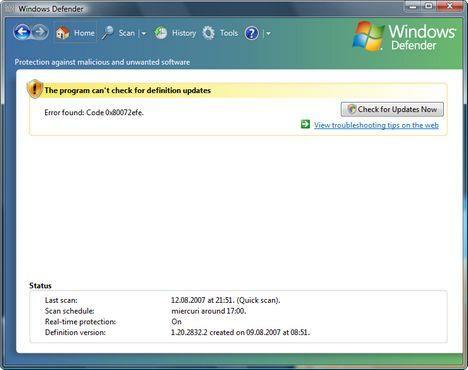 I can't uninstall windows defender becasue it is NOT listed in my programs. Since windows can't do a scan I for some reason can't watch movies on my laptop. I am in the same boat, ie, unable to update and Defender keeps closing, when I close the computer. It does NOT run every day as I requested either. To run a scan took a few hours but 5 & 12 seems excessive, probably the programmes you have running. 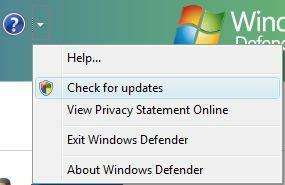 I'd love to be able to keep Defender running all the time and be able to update. Perhaps a Microsoft can tell us why we can't do these things! Sure am glad I have a good antivirus/antispyware/firewall. If I trusted my resources to your programs, any virus would fry my computer before WD finished scanning !!! 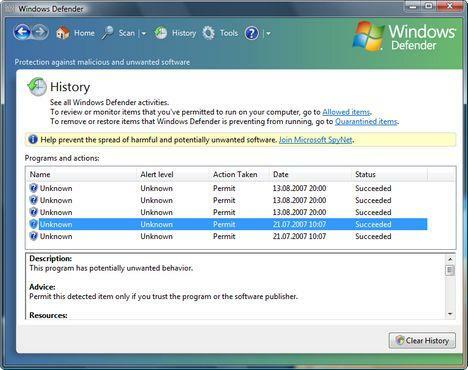 when I do a scan with windows defender, there are entries, which say this may cause unwanted behavior. But on the list, it says it is allowed. How do i disallow this, or remove these items? Most of them say HKEY blah ablah blah. Is this malware? 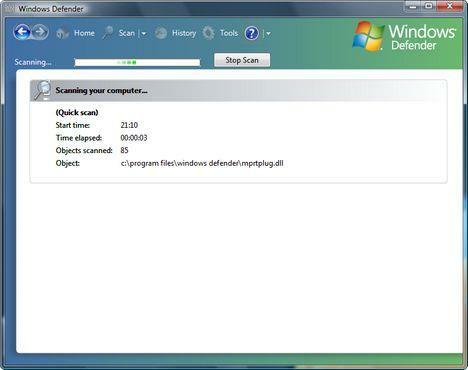 Windows Defender is on my computer; I know because it comes with Windows 7. 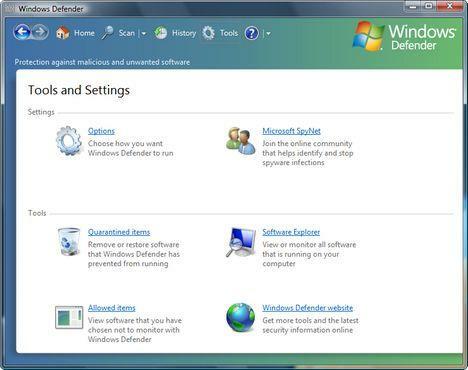 But recently I reinstalled the operating system (I usually do this twice a year at the end of each school semester), and while I used to be able to open up Windows defender to schedule a scan or other things (I even had a WD icon in my system notification icons area), I no longer can since reinstalling. What's the deal?